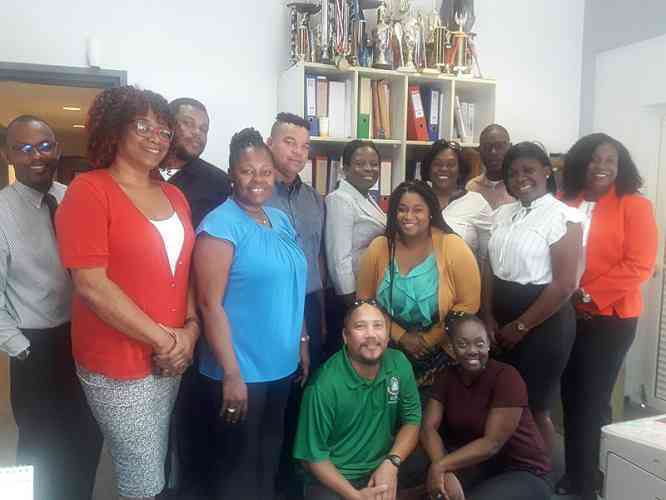 SOUTH REWARD–The St. Maarten Vocational Training School (SMVTS) opened the new school year on a positive note Monday with 50-plus new first formers and its full complement of teachers. The school has a total of about 225 students and is (still) strapped for classroom space. Principal Rita Bourne-Gumbs is, however, positive as work on the expansion of the school with four additional classrooms has resumed and she is hoping that the school will be able to use the new rooms by next year. She said the additional rooms does not mean that the school can accommodate more students, it just means that it will be able to comfortably house its current school population. Bourne-Gumbs said school opened on a positive note and she hopes it will continue this way for the remainder of the school year. “Every year we have a different set of students and this year, we look forward to a very good year,” she said. The principal said the school enjoyed “great success” amongst its graduating class last year, when 35 of the 36 students who sat their final exams passed. “What we saw with that crew was internal determination for success. Once you attend school every day and attend every class, you will have success because our staff work with students,” she said noting that while some of the students may have some challenges, they are very good with their hands. She said the large volume of work in the building construction sector following hurricane Irma is testimony as to how useful students will be in the community once they complete school as some of these trades are related to the studies that students are pursuing at SMVTS. First formers attended orientation day at the school on Monday. Orientation week will continue today, Tuesday, August 14, for first and second formers; on Wednesday, August 15, for first and third formers and on Thursday, August 16, for first and fourth formers. School will resume as per normal on Friday.